You are currently browsing the category archive for the ‘Ezekiel Emanuel’ category. Wow! The state of Alabama has passed and overridden the Governor’s veto of a budget that, per the Medicaid commissioner, does not allow us to meet the federal requirements to stay in the “voluntary” program. There was a hearing on the impact of the budget on Thursday. In the lead-up to the hearings (found here) Senator Pittman was quoted as saying that the reason was that “I think there are legislators who need to more fully understand the workings of Medicaid.” A fair statement; as I have as I previously explained (here) the funding of Medicaid in Alabama is incredibly complicated. The hearing included a very informative presentation by the Medicaid Commissioner that can be found here. Giving to deserving people, it seems is OK. It’s just that those who could get out and work, in the Senator’s estimation, need to get off their disabled rear ends and find jobs that provide health insurance. He goes on to say that the cuts will be made, the impacts will be felt, and people will react to what ultimately happens. There you have it. Willing to turn away $5,000,000,000 and dismantle a state’s care delivery system , so we can find out in our own little laboratory of democracy just how people will react. Again, wow! Meat-cleaver cuts hack spending indiscriminately. Cuts that fail to distinguish between high-value and low-value medical care would do more harm than good. Cost-shifting cuts don’t actually reduce health care spending; they just shift costs from the government to the private sector. … raising the eligibility age [for Medicare] would reduce government spending on Medicare, it would shift the costs to individuals and businesses. It would also increase the number of uninsured 65- and 66-year-olds, leading to worse health outcomes and making it harder for older Americans to find work. Penny-wise, pound-foolish cuts reduce current spending by a little but raise future costs by a lot. Raising co-payments for office visits and medications is a good example. Research shows that when older adults are charged higher co-payments, they reduce their primary care visits and use of prescription drugs. But the research also shows that forgoing this outpatient care leads to an increase in expensive hospitalizations. The seeds of a solution lie in the accountable care organizations, medical homes and bundled payment reforms that were authorized by last year’s Affordable Care Act. Accountable care organizations are groups of health care providers and hospitals that work together to treat patients. Medical homes coordinate primary care services. And bundled payments consolidate the many costs of an episode of care, like a hospitalization, into a single payment, incentivizing efficient delivery of tests and treatments. All of these reforms allow payments to be based primarily on the number of patients cared for and the quality of that care rather than on the volume of services provided. [O]pacity, leverage, and moral hazard are not accidental byproducts of otherwise salutary innovations; they are the direct intent of the innovations. No one at the major capital markets firms was celebrated for creating markets to connect borrowers and savers transparently and with low risk. After all, efficient markets produce minimal profits. They were instead rewarded for making sure no one, the regulators, the press, the community at large, could see and understand what they were doing. In the words of health care analyst Paul Batalden “Every system is perfectly designed to achieve exactly the results it gets.” There is a lot of money in the current system, thus a lot of folks who want to keep the status quo. Medicare, with the least opaque payment structure, is the most recent delivery payment vehicle to come under scrutiny by the pundits. A very efficient, though open ended system of paying for care through a fee-for-service model has been the hallmark of this program from the start. Congressman Paul Ryan has set his budget-cutting sights on this program (as I discussed here). This program, interestingly, is the one program where defined population (ALL Americans over 65), measurable outcomes, and existing resources would allow us to easily transition to more efficient, less expensive care. Combine a change in incentives with increased transparency regarding insurance and perhaps we can continue achieving different results. A miracle happened 50 years ago. In 1960 an article was published that documented 14 people who survived what up until then was a fatal heart stoppage. The survival was facilitated by closed chest massage, the act of pressing firmly and rhythmically on the chest until a heart rate returned. In 1962, the delivery of electricity in the form of direct-current, monophasic current (defibrillation) was found to result in increased survival. Prior to that, people whose heart stopped were just dead. 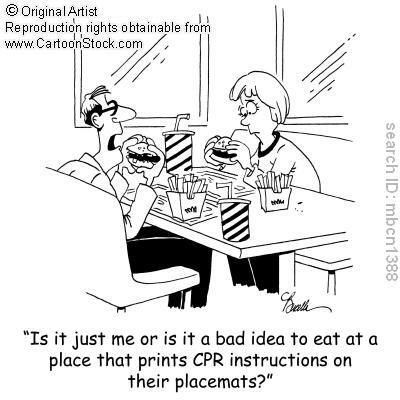 Unfortunately, not all people who need chest compressions and defibrillation are created equal. If the patient’s heart is stopped because of an episode of ventricular fibrillation and the defibrillator happens to be right next to the patient, the patient has a 1 in 4 chance of walking out of the hospital as if nothing happened. If the heart has stopped for any other reason, the chances are less than 1 in 10. For every minute it takes to get the defibrillator to the patient to administer the shock, the absolute chance of survival goes down by 7%. If the first check of the cardiac rhythm reveals a type of rhythm called pulseless electrical activity (PEA), the chance of leaving the hospital through the door (as opposed to the morgue) is less than 1 in 100 and the chance of not having a significant loss of neurologic function even if you leave through the door is less than 1 in 1000. If you have an underlying disease such as metastatic cancer or renal failure, the chance of surviving an episode of cardiopulmonary arrest is often less than 1 in 100 regardless of what the initial rhythm was. For some, a death due to arrythmia might be preferable to death due to an underlying disease such as dementia or painful metastasis. Allowing patients to determine what response they would prefer should cardio-pulmonary arrest occur is made more dificult because people really overestimate their possibility of survival should they go into cardiopulmonary arrest by a factor of 2-3 times. is the anointing given to those who are gravely bodily ill, especially those in danger of death from bodily illness or from violence already done to the body. The effects of the Sacrament are the strengthening and comfort of the soul of the anointed one, the remission of sins and some of their temporal punishments, and the possible restoration of bodily health. This rite was offered to all Catholics. It was considered important to receive this sacrament prior to death if one wished to ascend quickly into heaven. You will note, importantly, it was not a request specifically for divine intervention to restore bodily health (the recipient was expected to die). It was a request for forgiveness, comfort and solace. It offered solace not only to the stricken, but to the family members who shared the sick house as well in part because they were expected to participate in the service. The scene is familiar from television shows such as ER and Grey’s Anatomy. Paramedics rush a patient into the emergency room or a nurse in an intensive care unit shouts ―code blue. Crash carts are deployed and a doctor orders a procedure ―stat, such as ―start a central line. The doctor might intubate or ―bag the patient or, more dramatically, ―shocks them by applying the paddles to the chest immediately after someone yells ―clear. A nurse yells something about ―V-Fib so the doctor orders Lidocaine and hollers, ―charge to 300! Clear! and shocks the patient again. Sometimes the patient‘s heart starts again, and because of the miracle of medical technology the patients lives, although for how much longer we rarely find out. Sometimes the efforts of the medical staff are in vain, and the doctor ―calls it. Occasionally, the doctor does not quit until the futility of the exercise is apparent, sometimes pointed out by a nurse or another doctor. ―Time of death, 2:25. A nurse or technician turns off the monitors, and the high-pitched continuous tone, which had previously been a series of rapid beeps, goes silent. The doctors and nurses leave the room and the last camera shot is the corpse on a gurney, with tubes penetrating the body and the floor littered with medical waste. Dr Fox (I presume he got his doctorate) points out that dying is a part of living and suggests we need to continue to emphasize palliation and spirituality when caring for the dying. I hope we as a profession can change our focus from curing to caring for patients who are clearly making this transition. Offering someone who will not benefit a procedure such as ACLS because we are uncomfortable having a conversation is not right. Spending billions of dollars on end-of-life procedures known to be worthless to fight an enemy (death) who is clearly going to win is not right either. I hope that as defibrillation and CPR approach 60, we are finally able to put them in their rightful place in our ﻿armamentarium. As I discussed here, having such discussions is important. Maybe one day we’ll get paid for them. Garrett has since been somewhat discredited. It is not clear that the resources as they appeared limited were so in actuality. This seems to be, however, the fear of the Republicans with healthcare. They seem convinced (and I have to admit that there is some evidence to support this) that those who are now uninsured (and have no current access to the commons) once given access will consume unlimited resources. Interestingly, they feel like those who now receive Medicare are entitled to unlimited access to the health care commons…an interesting stance. What is really interesting is that Ezekiel Emanuel has been accused of formulating “death panels” as a solution to the problem of the healthcare commons. What has articulated is a way out of this problem of the commons. He clearly believes (as do I) that a certain amount of the “health care commons” should belong to all of us. To solve the problem of overuse, he suggests that we would have to select what is included in our “commons”. If we don’t want to be in a group that funds terminations for example, we don’t select that group. I would like to see this further articulated as it seems preferable over people who have no money for health care dying in the street to me.